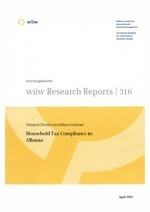 This paper applies a set of indicators of tax compliance to the household sector in Albania. These estimates are performed using available data for the years 1996 to 2003. Estimates of income declaration rates and of corresponding undeclared household income are computed using household final consumption data from national accounts and household survey data as well as detailed data on household taxation. Specific aspects such as remittances and the role of agriculture are explicitly taken into account and discussed. Our results show that household tax compliance in Albania is low by European standards. Although compliance overall has recovered from the collapse of 1997 and revenues have increased, the compliance rates for personal income tax and for social security contributions have significantly worsened in 2002 and 2003. This seems to be due to a disconnect between the formal goals set out as legislation and the revenue collection targets set by the relevant agencies.